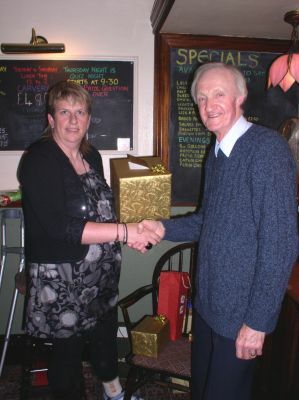 Dennis Allport chose not to stand for re-election as Vermuyden Group's secretary at our AGM on 4th December. Dennis had served an unbroken 20 years as secretary to the group - virtually for the full life of the Group which was founded in 1986. Dennis was instrumental in guiding the Group through its formative years and in setting up the structure to ensure its long term survival. He was certainly the longest serving member of our committee and must have been one of the longest serving committee members in the LDWA. Dennis and his wife Mavis have worked tirelessly on behalf of both the Vermuyden Group and the LDWA and are well known to many members of the LDWA as he was (and still is) the driving force behind the Vermuyden Group checkpoint on many 100 events and of course he has personally completed over 10 of them. In addition to this he has also organised walking holidays both at home and abroad and has represented Vermuyden Group on many occasions at national meetings. Although Dennis has now retired from committee membership he is still commited to supporting both the Group and the LDWA from the back benches and no doubt will still be seen on many events as distance walking is in his blood. 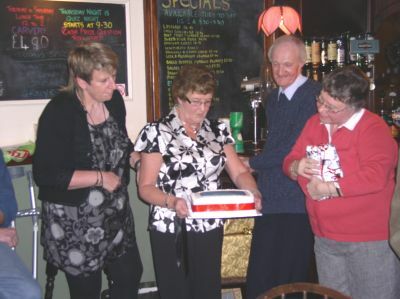 As a token of our appreciation of the hard work done by Dennis and Mavis over the past 20 years the Group members decided to present them both with items of Waterford Crystal and a special cake at our Christmas dinner on 8th December. 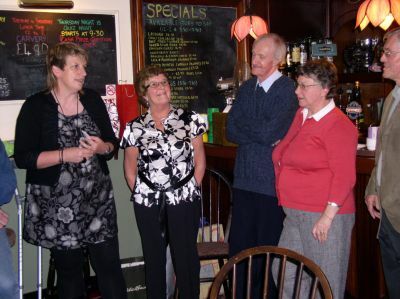 It was with great regret that we accepted Dennis's "resignation" but we are delighted that both he and Mavis will still be giving their ongoing support to both the Vermuyden Group and to the LDWA.